In early early 2000 or so, BASF embarked on an aggressive R&D program targeted at an improved method for the synthesis of (-)-Menthol. 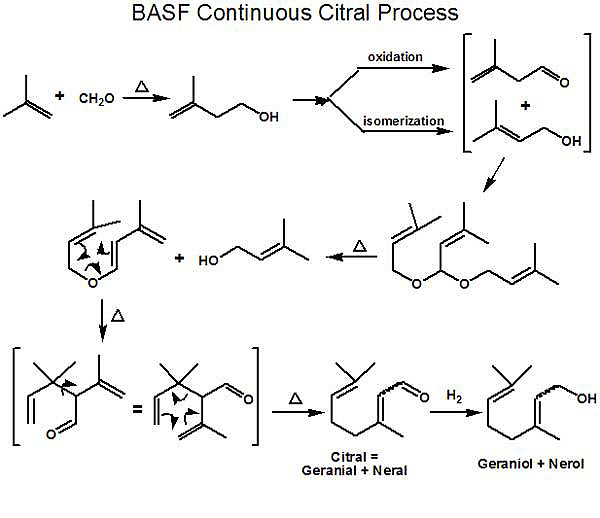 For background, it is important to realize that BASF had developed a remarkably sophisticated process for the synthesis of citral (an important intermediate for producing Vitamin A) which came on stream in 1981. In 2004, BASF opened a new highly efficient continuous process plant in Ludwigshafen with an annual capacity of 40,000 metric tons of citral. This process, starting with isobutylene and formaldehyde is shown in the first schematic (Ref.1). With such capacity, BASF has continued to extend its citral value chain with a number of new & improved products. While linalool, geraniol & nerol (as well as related products such as citronellol, citronellyl nitrile, geranyl acetate, hydroxycitronellal, hydroxycitronellol, nerolidol, phytol, iso-phytol) have long been produced, since menthol is one of the worlds major fine chemical commodities (with an annual production of about 20,000 metric tons) - it presents a major potential opportunity for BASF. Symrise and Takasago are currently the only major producers of synthetic (-)-menthol (producing about 5000 metric tons/year, combined). The price of natural menthol largely determines the economic viability of synthetic menthol production. 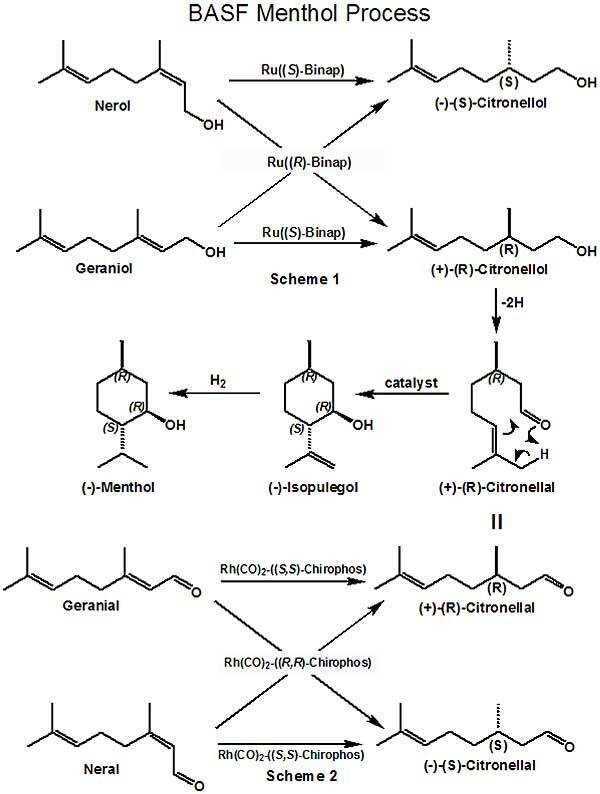 The BASF menthol process utilizes (+)-(R)- citronellal which can be produced from either geraniol or nerol by chiral catalytic hydrogenation to (+)-(R)-citronellol (Ref. 2) (in a manner similar to that described in 1987 by Ryoji Noyori and co-workers [Ref. 3]) followed by catalytic dehydrogenation to (+)-(R)-citronellal. In addition, BASF has also achieved the direct chiral catalytic hydrogenation of neral or geranial to (+)-(R)-citronellal (Ref. 4). This latter route as depicted in Scheme 2 appears to be the commercial route. BASF has recently developed refined processes for the cyclization of (+)-(R)-citronellal to (-)-Isopulegol that minimizes the undesirable isomeric isopulegols (Ref. 5); further they have developed an improved process for enriching the (-)-Isopulegol before the hydrogenation step to (-)-menthol (Ref. 6). A continuous distillation process for purifying the final menthol product has also been achieved (Ref. 7). BASF is constructing a new production plant for the aroma chemical L-menthol at the company's Ludwigshafen site. The new plant is expected to come on stream in 2012. L-Menthol is another important addition to BASF's citral value chain. The investment will create 35 new jobs in Ludwigshafen. "As the world's top-selling aroma chemical in tons, L-menthol is an ideal addition to our product range in a strong growth market. The move consolidates our position as a leading aroma chemicals supplier," commented Gabriel Tanbourgi, head of the Care Chemicals division. "BASF developed and patented the L-menthol production method itself. It enables us to supply an extremely pure product of superior quality." Please note that the above references encompass only a small number of the numerous BASF patents & patent applications relative to menthol synthesis. The chiral catalysts indicated are from representative examples in BASF patents or patent applications and may or may not be the ones actually the most efficient.